The second tab of the MetaTrader 4 Terminal window, the Account History tab, stores information about each trade operation the trader has conducted. It consists of 15 different columns. You can see the Account History tab displayed below. – Order column displays the operation’s ticket number. This number is unique for each trade. – Time section shows the time of position opening in an YYYY.MM.DD HH:MM format. – Type column displays the trade operation type. There can be only three types of operations listed here: “Buy” for a long position, “Sell” for a short position and “Balance” for depositing funds in the account. – Size column shows the amount of lots the user has traded in the operations. – Symbol tab displays the name of the security traded in the operation. – Price column stores the prices of position opening. 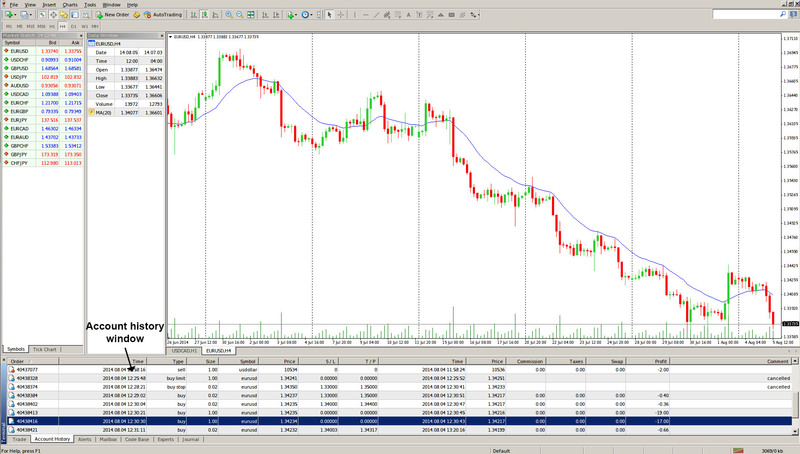 – S/L column shows the level of the Stop Loss orders placed. If a stop-loss has been hit and closes the order, its corresponding cell will be colored in red, and “[s/l]” will appear in the field of comments. If the trader did not place a stop-loss order, zero value will appear in this field. On the other hand, if a stop-loss order was placed, but did not get triggered, its value will still be shown in this field. The cell will not be colored, and no “[s/l]” will be displayed in the field of comments. – T/P column shows the level of the Take Profit orders placed. If a trade position gets closed by this order, its corresponding cell will be colored in green, and “[t/p]” will appear in the field of comments. Similarly to the S/L column, if no order has been placed, zero value will appear in this field. However, if an order is placed, but does not get triggered, its value will still be shown in this field and the cell will not be colored. Also, there will be no “[t/p]” comment in the comments section. – Time column (second one) displays the time of position closing, again in an YYYY.MM.DD HH:MM format. – Price section (second one) shows the price of position closing. – Commission tab displays commissions charged by the brokerage company when performing trade operations. – Taxes column stores taxes charged when performing trade operations. – Swap column displays the swaps charged. – Profit tab shows the financial result of each transaction. A positive number indicates that the transaction was profitable, and vice versa. The profit is listed only in the deposit currency, unlike the “Profit” section of the “Trade” tab. – Comments section stores comments on trade operations. A comment can be added only at the opening of a position or placing an order. The comment cannot be changed when an order or a position are being modified. A comment to the trade operation can be inserted by the brokerage company. By clicking the right mouse button over the Account History window, a context menu with 11 commands will appear. They allow to change the span of the trackback period, to export data as a report and to add or remove some of the Account History tab’s components. – All History shows the entire account history, removing any time limitations. – Last 3 Months will display the account’s history dating three months back. – Last Month option will change the lookback period to one month. – Custom Period allows the trader to choose an exact period of time to display his/her account history. By executing this command, a new window will appear where the trader can select between a set of pre-defined ranges (the “Period” field) or specify a period using the “From” and “to” fields. – Save as Report options exports the account history as an HTML file. Upon clicking it, a window allowing to select a path for saving the file will appear. – Save as Detailed Report also saves the account history as a report in the form of an HTML file but it has an additional set of parameters compared to the previous option. After this command has been executed, a window allowing to select a path for saving the file will appear. – Commissions command is used to show or hide the “Commissions” column in the Account History tab. – Taxes option displays or hides the “Taxes” section in the Account History tab. – Comments is designed to show/hide the “Comments” column in the Account History window. – Auto Arrange option automatically arranges the Account History tab’s column sizes when its window size is changed. – Grid command is used to display or remove the grid used to separate the Account History screen’s columns.